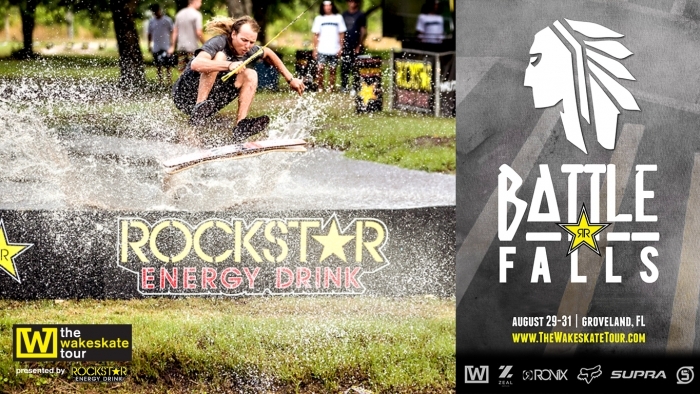 Groveland, FL - After a full season of anticipation, Battle Falls lived up to the excitement as this weekend’s amazing event proved that wakeskating is consistently one-upping itself. The Wakeskate Tour’s 2013 season has been a growing success and it’s safe to say this tour has made a lasting impression on the industry. Riders from all over the world - France, South Africa, Australia, Switzerland, Canada, England, United States - flocked to the Hansen’s central Florida oasis to compete in the last stop of the season for The Wakeskate Tour. Spectators, local and feral, enjoyed the view from the Zeal Optics halfpipe and stayed cool at the Ronix Pool Party, both of which will certainly be up for consideration in future events. The up-&-back setup at Battle Falls, decked with new metal rails, accompanied by the System 2.0 brought on a wide array of competitors through the qualifying rounds on Friday, making for loaded heats in Saturday’s quarter-finals and semi-finals. Each round raised the bar as riders focused on perfecting their most technical lines for the judges. Austin Pastura rode amazing all day, securing him a spot on the podium with his signature, finishing in 3rd place. Just barely edging him out was Andrew Pastura, whonwith this 2nd place finish locked down his second overall title as The Wakeskate Tour champion. The story of the day was Reed Hansen showing consistency is the name of the game, dominating his way through quarters and semis. In the six man super-finals, Reed showed how diverse and technical he can wakeskate by cleanly stomping rare flip tricks up the chute, getting gnarly on the new rails, & nailing big moves down the drop. His unique prowess paved the way to being Battle Falls champion two years in a row. On behalf of The Wakeskate Tour, we’d like to thank the Hansens, Rockstar Energy, Fox Wake, Ronix Wake, Supra Boats, Zeal Optics, Sesitec System 2.0, Chick-Fil-A, and every rider and spectator who came out to support the 2013 season of The WakeskateTour. We look forward to the future of the tour and the future of wakeskating. Thank you.